The following agreement outlines the rules and regulations for properties managed by Beehive Property Management. Each guest of Beehive Property Management properties must sign and comply with these terms and conditions. Pet Policy| Pets are NOT permitted under any circumstance. Evidence of a pet will be grounds for immediate termination of the rental agreement. Evidence of a pet will result in an additional $800 cleaning fee. Smoking Policy| Smoking is NOT permitted under any circumstance within the interior of the property, including the garage. Evidence of smoking with be grounds for immediate termination of the rental agreement. Evidence of smoking will result is an additional $800 cleaning fee. Authorized Use| Guests will use the property only as a vacation rental residence. Guests will use the property for lawful purposes only and will comply with any and all legal regulations. Guest Duties| Guests will maintain the property in the condition they received the property upon arrival, and will only use the property in a careful and lawful manner. Guests will pay for any damage to the property, including, without limitation, any necessary or appropriate maintenance and/or repairs required because of guests damage. Guest is responsible for securing the property which includes windows and doors. Guest will be responsible for any losses incurred due to guests failure to properly secure the property. Guest is responsible for reporting any property damage or equipment not in operating condition upon arrival, unless otherwise informed in writing from Beehive Property Management. Damage Protection Insurance| The damage insurance is a fee built into your reservation booking total. This insurance plan covers unintentional damages to the rental unit interior that may occur during your stay. Damages must be disclosed to Beehive Property Management before or upon check-out of your stay. The insurance will pay a maximum benefit of $1500.00. Any damages that exceed $1500.00 will be charged to the guest. The guest shall be responsible for all damages or alterations caused by the guests intentional negligence, or damages caused by any person within the guests party during the specified rental period. Should any damages or alterations be noted upon inspection after the guests departure, guest agrees to pay for the entire cost of repairs. Guest authorizes the credit card on file to be charged. If the charges or damages exceed the guests credit limit, the guest agrees to pay the difference immediately. Payment| An advance payment equal to 50% of the total cost of the reservation is due upon booking. The advance payment is not a security deposit, it is 50% of your total booking cost. Payments can be made by MasterCard, Visa, or Discover. If guest must pay with a check, guest is required to reach out to Beehive Property Management to make arrangements. Checks can be made payable to Beehive Property Management. Balance of Rent| The remaining 50% of guests booking total must be paid in full, 60 days prior to arrival. If guest is booking a property within 60 days of arrival the balance of rent is to be paid in full upon booking confirmation. If guest has booked directly through the Beehive Property Management website, the balance or rent will be automatically taken from the credit card guest has provided, Beehive Property Management will send an email notification 15 days prior to the credit card being charged for the remaining balance of rent. It is the guests responsibility to contact the Beehive Property Management office with any updated payment information. If the guests credit card is declined and Beehive Property Management cannot get in contact with the guest within a timely manner, the guests reservation will be canceled and any payments made will NOT be refunded. Cancellations| A sixty (60) day notice is required for cancellation. If a reservation is canceled sixty (60) days or more prior to the reservation arrival date a refund will be given, less the reservation’s processing fee. Cancellations that are made fifty nine (59) days or less from the reservations arrival date are non-refundable unless the dates are re-booked by another guest. If Beehive Property Management is able to re-book the property for the guests reservation dates, a refund will be given that is equal to the new amount collected, less the original reservations processing fee. If Beehive Property Management is unable to re-book the property for the number of days equal to the guests scheduled reservation, the guest will forfeit the difference. No refund will be given if dates are not re-booked. We HIGHLY recommend travel insurance! AirBnB Reservations| If the guest has booked through AirBnB the guest complies with the AirBnB strict refund policy. Any property that is booked through AirBnB will only receive a 50% refund of the total booking cost, if the reservation is canceled sixty (60) days or more prior to arrival. If the reservation is cancelled fifty-nine (59) days or less from the arrival date no refund shall be given. If the guest has extenuating circumstances for why they need to cancel their reservation, documentation must be provided to AirBnB customer service. AirBnB customer service will determine if the circumstance warrants a refund. 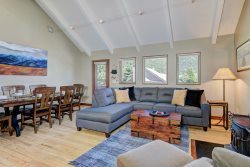 VRBO/ HomeAway Reservations| If the guest has booked through VRBO the guest complies with the the VRBO/ HomeAway strict refund policy. Any property that is booked through VRBO/ HomeAway is eligible to receive a full refund if the cancellations is made sixty (60) days or more prior to arrival. If the reservation is canceled fifty-nice (59) days or less from the arrival date no refund shall be given. Travel Insurance| CSA Vacation Rental Insurance is available with all guests reservations. CSA Insurance covers trip cancelation, trip delay / interruption, rental car collision, baggage delay, medical expense/emergency medical transportation, roadside assistance, concierge service, identity theft and more. The cost is 7.1% of the guests total booking and covers everyone within the guests travel party. Beehive Property Management strongly recommends all guests purchase this valuable protection, which will reimburse guests for prepaid, non-refundable expenses due to certain unforeseeable circumstances. When making a reservation online, you have the option of selecting either Yes or No before the final amount is totaled. If declined, you acknowledge you have read and understand our cancellation policy and choose not to purchase Vacation Rental Insurance on behalf of all occupants. Check- In Policy| Check-in is 4pm or later. No early check-ins are available unless previously arranged with Beehive Property Management. If any guests arrive prior to 4pm without permission from Beehive Property Management fees will apply. If Beehive Property Management finds guests have checked in prior to 4pm on the scheduled check in day without permission a ½ days rent will be charged to the guests card on file. Guests may call or email 48 hours in advance to request and early check-in, Beehive Property Management can not allow an early check-in outside of 48 hours’ notice. Early check-ins vary with the schedule of the property the guest has booked. Check- Out Policy| Check-out is 10am or earlier. No late check-outs are available unless previously arranged with Beehive Property Management. If any guests depart later than 10:30am without permission from Beehive Property Management fees will apply. If Beehive Property Management finds guests in the property later than 10:30am on the scheduled check-out date, a ½ days rent will be charged to the guests card on file. Guests may call or email 48 hours in advance to request a late check-out, Beehive Property Management can not allow a late check-out outside 48 hours’ notice. Late check-out approvals vary with the schedule of the property the guest has booked. Additionally, upon check-out guest will follow the check out procedure which is listed in the guest book within each home managed by Beehive Property Management. Maximum Occupancy| The maximum number of guests is listed within the properties description. Additional guests that exceed the maximum number of guests allowed will result in immediate termination of this rental agreement and guest will forfeit all rental fees. Operation of Equipment| Guests will use and/or operate all furniture, furnishings, appliances, electric, gas, and plumbing fixtures located in and around the property safely and only for their intended purposes. If guest does not know how to properly use/operate any equipment, guest is to contact Beehive Property Management for instructions. Any damage caused by guests misuse will become the responsibility of the guest to have repaired and/or replaced. Noises and Disturbances| Guest will behave in a civilized manner and will respect the rights of surrounding property owners and guests. Guest will not disturb, annoy, endanger, and/or interfere with surrounding property owners and guests. If excessive noise or disturbances occurs resulting in notification by police or neighbors, guests may be asked to vacate the property and will forfeit the reservation and any money paid. Parking| Vehicles are to be parked in designated parking areas only. Any illegally parked cars are subject to towing; any applicable fines/towing fees are the sole responsibility of the vehicle owner. Beehive Property Management assumes no liability. Properties that require parking passes will have passes available to guests upon check-in. Guests must display parking pass on the rear view mirror at all times. Failure to display may result in towing of vehicle at renter's expense. Please leave the parking passes inside the property upon departure. If the guest checks-out of the property and does not leave the parking passes, garage door opener, or house keys at the property a $100 fine will be charged to the guests card on file. Property Alterations| Guest will not make any alterations in or to the property, including moving furniture, paintings, rewiring or moving electronics (TVs, stereos, etc.) Guest will not use fastening devices, nails, or adhesive materials on walls or furniture. All media devices, TVs, Stereos, Gaming systems, etc.. will be left in working order. You will be charged if you unplug or reconfigure devices and we need to troubleshoot or restore the system to working order for the next guest. Hot Tubs| Hot tubs are considered a luxury amenity, guest acknowledges no refunds or discounts will be given if hot tub is out of service during guests schedule reservation. Beehive Property Management will do everything within their control to ensure the hot tub is fully functioning for each guests reservation. No children under the age of twelve (12) years are permitted to use the hot tub without an adult present at all times. When using the hot tub, remember there is certain health risk associated with this facility. Guests use of the hot tub is at guests sole risk. Beehive Property Management makes no representations or warranties concerning the conditions and/or use of the hot tub. Guest is fully aware that the hot tub and surrounding patio/deck may be dangerous. Guest will learn about safety precautions during the check-in process and/or by reading the safety information in the guest book. A local Hot Tub Company sanitizes refills and replenishes chemicals in all tubs prior to guests arrival. Therefore, the water may not be warm until later in the evening on the first night of the guests stay. Guests will rinse off before entering the hot tub to ensure the tub stays clean for the duration of the guests reservation. Please use the chemicals as instructed! Hot tub covers are for insulation purposes and are not designed to support a person or persons. DO NOT STAND ON THE HOT TUB COVERS, they will break and guests may be charged for a replacement cover. Please remember to cover hot tub when not in use to maintain temperature. If at any time the hot tub looks cloudy or dirty, guest will cease further use of the hot tub and call Beehive Property Management immediately. Wireless Internet / Telephone/ Satellite TV| Wireless internet and Satellite TV are considered luxury amenities, guest acknowledges no refunds or discounts will be given if the internet service or Satellite service is not functioning. Beehive Property Management will do everything within their control to ensure the internet is fully functioning for each guests reservation. Most cell phones have good reception in Big Sky, please check with your service provider to determine coverage. Beehive Property Management is not responsible for limited or non-existent coverage. Daily Housekeeping| Linens and towels are provided in each property. Daily housekeeping is NOT included within the reservation booking total. Guests can request housekeeping for an additional fee. Beehive Property Management cannot guarantee housekeeping will be available, this will depend upon the cleaning schedule of Beehive Property Management. Fireplace Policy| Guest agrees to NOT throw any paper or other combustible materials into the fireplace. Guest agrees to build a fire within reasonable size to the fireplace, guest will not overfill the fireplace. Storm/ Road Conditions/ Property Conditions| Guest acknowledges that no refunds will be given for storms that alter your plans. Mountain roads are winding and steep, we highly recommend a four wheel drive and/or chains during the snow months. Beehive Property Management does not refund due to (A) inclement weather; (B) malfunction of equipment and/or any Property amenities (e.g. TVs, DVDs, telephone, hot tub, internet, etc.) (C) Acts of God i.e. natural disasters or other acts beyond our control. Beehive Property Management will make a reasonable effort to ensure repairs are made and that all equipment is kept in good working order and condition. We HIGHLY recommend travel insurance! Ski Access| Beehive Property Management cannot guarantee snow conditions at the time of any guests scheduled rental, and are in no way liable for snow conditions that contribute to limited or restricted ski access. Beehive Property Management will not be liable for any loss or injuries during ski activates. We HIGHLY recommend travel insurance! Transportation Requirements| Guests may need to have a car or some other form of transportation in order to easily access restaurants, shops, and other services/ activities. Skyline Bus offers a free shuttle service to and from Big Sky Resort, and to other popular areas of Big Sky. The shuttle does not pick up directly at the property door steps, there are multiple pick up/ drop off locations for guests convenience. Beehive Property Management units are privately owned, no transportation service is available to guests. Indemnification| Guests will defend, indemnify, and hold Beehive Property Management, and Beehive Property Management members, managers, employees, agents, contractors and authorized representatives, harmless for, from, and against any and all claims, actions proceedings, damages, liabilities, injuries, losses, and expenses of every kind, whether known or unknown, including, without limitation, reasonable attorney fees, resulting from or arising out of, whether directly or indirectly, the following: (a) any injury or death to any person; (b) any loss, theft, vandalism, and/or damage to the Property; and/or (c) Guests breach and/or failure to perform any guests obligation under this Rental Agreement. Inspection of Property| Beehive Property Management representatives and agents may enter the Property, at any time with or without prior notice, for any of the following purposes: (a) making necessary or agreed maintenance, repairs, decorations, alternation, or improvements to the Property, or to supply necessary or agreed services; (b) to verify that Guest has complied with the terms of this Agreement; and/or (c) in case of an emergency. Beehive Property Management will give notice whenever possible. Remedies| Each provision contained in this Agreement will be treated as a separate and independent provision. The un-enforceability of any one provision will in no way impair the enforceability of any other provision. This Agreement will be governed by and construed in accordance with the laws of the State of Montana, and venue for any action concerning the Agreement will lie in Gallatin County, Montana. If litigation or arbitration is instituted to enforce or determine the parties rights or duties arising out of the terms of this Agreement, the prevailing party will recover from the losing party reasonable attorney fees incurred in such proceedings to the extent permitted by the judge or arbitrator. If there is more than one Guest, each Guest will be jointly and severally liable for the performance of each and every guest obligation arising out of or under this Agreement. The termination of this Agreement, regardless of how it occurs, will not relieve a party of any obligations that have accrued before termination. Written Exceptions| Any exceptions to the above mentioned policies must be approved in writing, in advance. My Signature below acknowledges my agreement and understanding of the responsibilities and all provisions of this Rental Agreement.